On the water view. Pull boat right up to deck and enter house. Great view of the shrimp boats and work boats. And the deep sea fishing boats go in and out. Out door deck with charcoal grill for cooking catch of the day. Fully equipped kitchen for preparing meal. While getting ready for a great day of fishing freshwater or saltwater .Ice maker and deep freeze for all the fish you catch. Also sort walk to marina for a great dinner and watch guides bring in catch and clean them. David , Pam and Pat .... David "my dad " has always been a great fisherman and found this wonderful place to do the best fishing. Pam and Pat have joined the adventure of fishing and just a good time. A great place for our family to enjoy a great day of fishing or sitting on deck watching boats go in and out. This is a great location houseboat, on the water. Pull your boat up to dock and walk right in... Also enjoy morning sunsets from front deck and gulf sunset from top deck.. Pull right up to dock. Ice maker. We had a great time at Venice Sunrise House. The house worked great for my husband and I and our three teenage kids. They loved the bunk beds and the room set up. It was a a bit of a squeeze for my husband and I to get in the bed, but it was so comfortable we slept like rocks! The house had everything we needed for a great weekend. Exactly what we expected. The charter was able to pick us up on the porch. Cozy little place that slept 6 guys perfectly using the couches. Only downfall is the clean up crew came at 9:00 to see what time we would be out. Although they were nice felt like we needed to hurry a little. Very convenient and plenty room for 6. It is right at the end of row "B" and the cart made it simple for us to get our thing to house. Showed up friday was able to grill steaks and baked potatoes and watch the game with no problem. Got some sleep for a long day of fishing and came back to a cool comfortable house that made the perfect ending to a perfect day. Very happy with this place I would definitely stay again. We went with a couple of friends for a few days. We have stayed at several houseboats here. Some have been nicer some worse. But going for a fishing trip we would definitely stay here again. 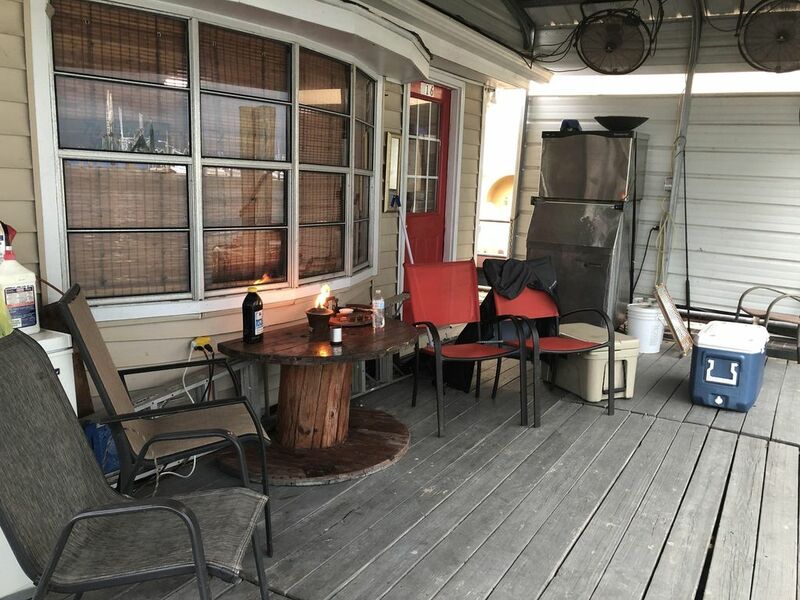 4 friends stayed 4 days in this Venice Marina houseboat. The accommodations were great for our stay, ice machine provided all the ice we needed although we had to reset it 2 times. Kitchen was well stocked and I will surely re book if available. Only issue was the key set in the entrance door couldn't be opened we had to access the camp from the marina entrance, not an issue only an inconvenience. My husband and I have wanted to go to Venice for 15 years! Being avid fishermen, Venice has been a bucket list item for us since he and I met. So, he turned 50 and we pulled the trigger! Pam's place was GREAT! It was clean, cool, and comfortable. The location is wonderful! A very short walk to the gas docks to meet the guides. I can't tell you how nice it was to have the ice machine and watch the boats come and go while cooking dinner straight out of the water! There were 5 of us and the house was a perfect size for us! Pam, thank you for sharing your terrific vacation home with us! I hope we can do it again sometime!